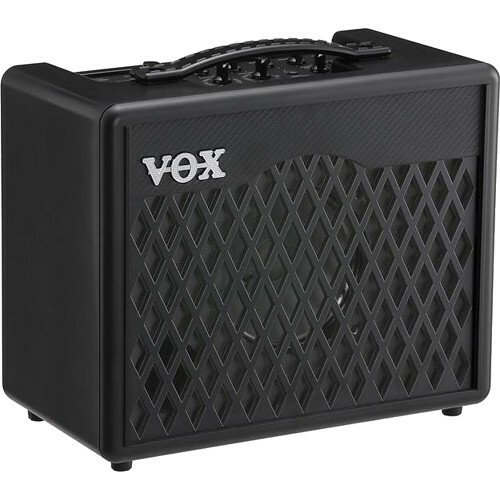 The VX I Guitar Amplifier from VOX features the VET (Virtual Element Technology) modeling circuit that offers guitarists the benefits of both digital and analog amplifier design. To produce an authentic and efficient sound, this amp employs a bass reflex structure combined with a sealed, one-piece speaker enclosure. The cabinet's shape, curvature of the front and back surfaces, and the internal reinforcement ribs have all been designed to optimize the resonance.The VX I Amp features 11 classic amp models and eight distinct effects, and it allows for 22 unique user presets. Complementing these great amp sounds are eight classic effects, which include chorus, flanger, phaser, tremolo, tape-style delay, analog-style delay, and two types of reverb: spring and hall. A conventional wooden baffle retains the projection and tone of a classic guitar amp, while a lightweight and durable ABS material gives the cabinet acoustical properties with quality sound and easy portability. Box Dimensions (LxWxH) 16.5 x 14.1 x 9.9"